Janet Yellen is an American economist. Prior to serving the Chair of the Board of Governors of the Federal Reserve System, she served as Vice Chair from 2010 to 2014. She was the President and Chief Executive Officer of the Federal Reserve Bank of San Francisco. She was also the Chair of the White House Council of Economic Advisers under President Bill Clinton. United States Senate confirmed Yellen’s nomination for the Chair of the Federal Reserve Board of Governors in 2014. She was sworn in the same year thus making her the first woman to hold position. 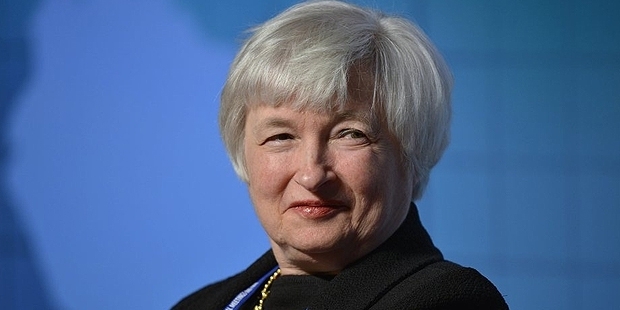 Janet Yellen was born to Anna and Julius Yellen on 13 August 1946 in Brooklyn, New York. She graduated with a economics degree from Pembroke College in 1967. While perusing her graduation she switched her majors from philosophy to economics. Eventually she received her Ph.D in 1971 from Yale University. Yellen has written a thesis titled Employment, output and capital accumulation in an open economy: a disequilibrium approach. 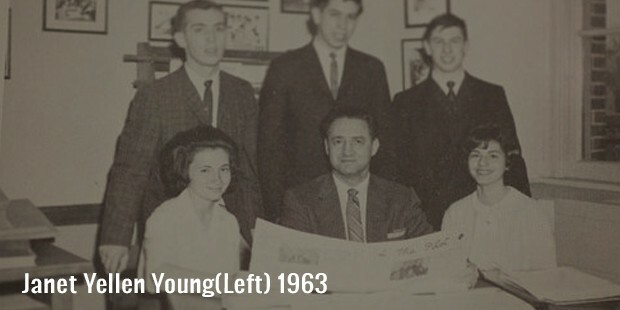 Yellen briefly worked a professor at Harvard from 1971 to 1976 and also as a lecturer from 1978 to 1980. Yellen was an economist with the Federal Reserve Board of Governors in 1977-78. 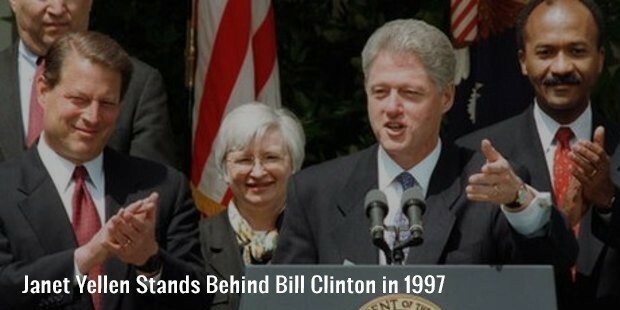 Yellen has served as Chair of President Bill Clinton’s Council of Economic Advisers from 1997 to 1999. In 2010 she was the President and Chief Executive Officer of the Federal Reserve Bank of San Francisco and a voting member of the Federal Open Market Committee. In 2013 Yellen replaced Bernanke as head of the Federal Reserve. 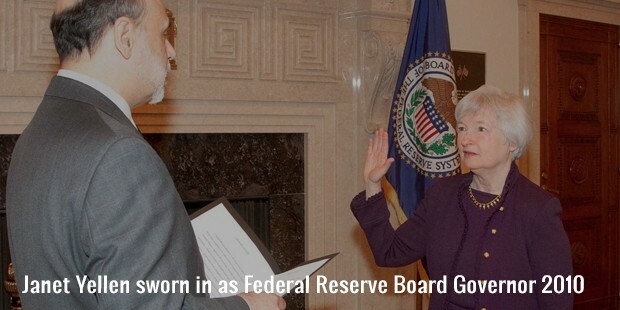 In 2014 she was confirmed as Chair of the Federal Reserve by a vote of 56-26. Yellen was elected by the Federal Open Market Committee as its chair on 30 January 2014. She took office on 3 February 2014. At present she is the Chair the Board of Governors in Federal Reserve System. 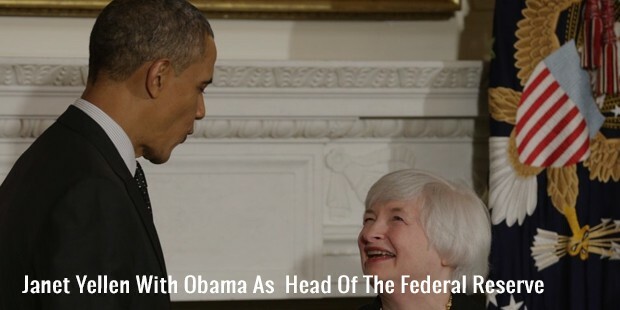 President Obama nominated Yellen as the Vice-chair of the Federal Reserve System in 2010. The same year Yellen was sworn in for 4-year term ending in 2014. She simultaneously began a 14 year term as a member of the Federal Reserve Board that expires in 2024. Yellen was included in the 50 Most Influential list of Bloomberg Markets magazine. She was named as the second most powerful woman in the world in 2014. 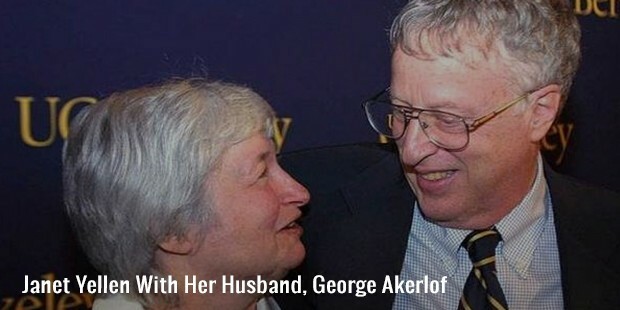 Janet Yellen is married to George Akerlof. Akerlof is a Nobel-Prize winning economist and also a professor at Georgetown University. He also is a professor at the University of California, Berkeley. The couple is blessed with a son Robert Akerlof who also teaches economics at the University of Warwick. Yellen received the Wilbur Cross Medal from Yale in 1997. She also received an honorary Doctor of Laws degree from Brown University in 1998. In 2000 she received an honorary Doctor of Humane Letters from Brad College. She was elected Distinguished Fellow of the American Economic Association in 2012.